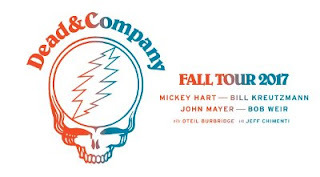 Dead & Company, the continuation of the retired Grateful Dead with Bob Weir, Mickey Hart, Bill Kreutzmann and John Mayer, have announced a new group of dates. The Grateful Dead called it quits after their Fare Thee Well shows on July 3, 4 and 5, 2015 at Soldier Field in Chicago. Just over a month later, on August 6, 2015, Dead & Company was officially announced. To date, they have done three tours. The new shows start on November 12 and 14 at Madison Square Garden in New York and follow with performances in such major cities as Philadelphia, Boston, Washington, Detroit, Atlanta, Dallas and New Orleans. Those interested in any of the dates need to register for Ticketmaster's Verified Fan program which was started to cut down on scalpers buying large groups of tickets. All shows except for December 7 and 8 go on sale for American Express cardholders on September 12 with general sales starting September 16. The two Florida shows go on sale September 19 for AmEx and September 23 for general sales.